Are you paying Realtor.com (or another real estate service site) for services you're not utilizing? We can help you get set up with them - affordably! Check out our web site design services! Several listings can fit on one page of a site - bringing you cost-effective advertising for your listings, not to mention a great marketing tool for your listing services! 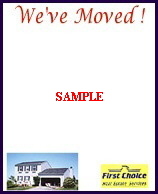 To see one of our real estate clients' sites, click here. Great Gift Idea for your Clients! We'll have the note pads or postcards ready for you to give to your client at closing time! Only $16 for 2 pads of 30 sheets each! Only $20 for 16 post cards! See Personalize It! for more ideas! 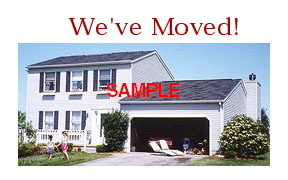 New address notification postcards: 4 1/4" x 5 1/2"